In 2-quart saucepan, mix seasoned ground beef, salsa and corn. Cook over medium heat, stirring occasionally, until thoroughly heated. Stir in 1/2 cup of the cheese. Spoon about 1/2 cup beef mixture into each lettuce leaf; place 2 on each individual plate. Top each lettuce cup with about 1 tablespoon remaining cheese, 1/4 cup crushed chips and 1 tablespoon sour cream. Instant finger food! 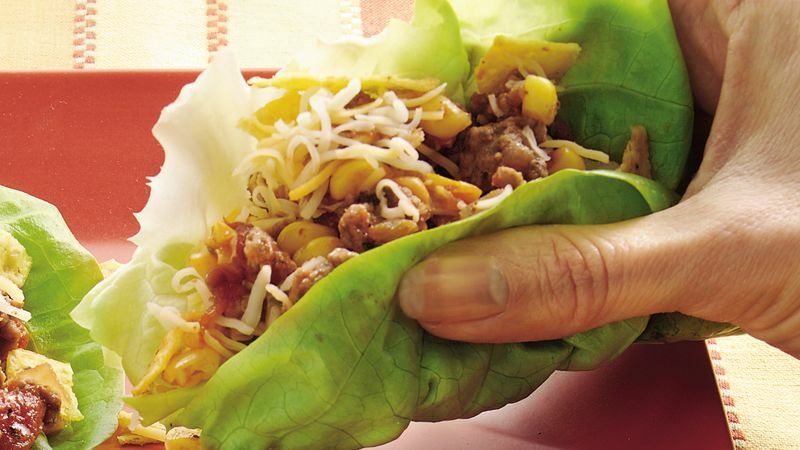 These filled lettuce cups are fork-fare, but if your lettuce leaves are large enough, encourage the kids to wrap the lettuce around the filling and eat them with their hands.